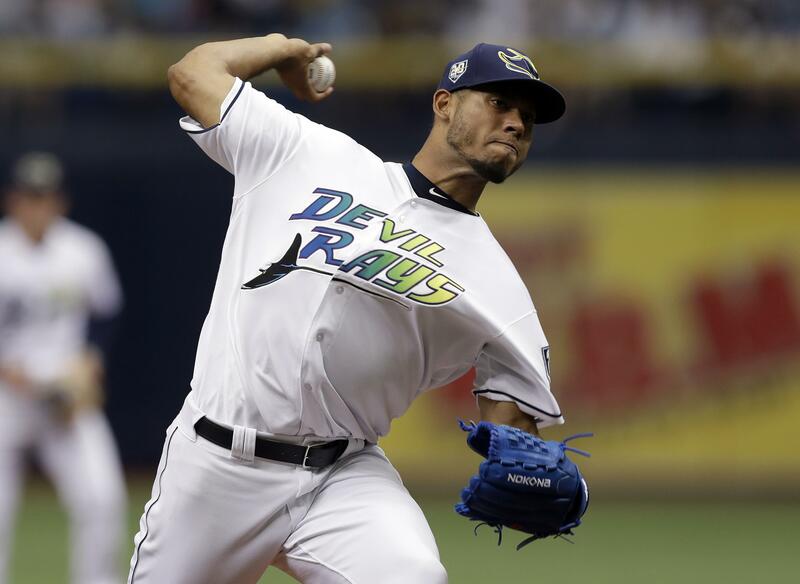 Sat., June 23, 2018, 9:49 p.m.
ST. PETERSBURG, Fla. – Wilmer Font worked into the sixth inning to get his first major league win, Willy Adames homered and the Tampa Bay Rays beat the New York Yankees 4-0 on Saturday. Font (1-3) allowed three hits, one walk and struck out four over 5 2/3 innings. Four relievers completed a four-hitter. Adames had an RBI single during a two-run second and added a solo homer in the seventh off Sonny Gray (5-5). The Rays have won the first two of a three-game series against the Yankees, who have the best record in the majors. New York (50-24), coming off a three-game sweep over Seattle, is the only team in the big leagues not to have dropped more than two straight games this year. This is the latest the Yankees have gone into a season without losing three in a row since August 1954. Reds 11, Cubs 2: At Cincinnati, Anthony DeSclafani hit the first grand slam by a Cincinnati pitcher in 59 years, helping the last-place Reds beat the Chicago Cubs for their sixth consecutive victory. It was Cincinnati’s third slam in five days and major league-leading seventh of the season, two short of the record set in 2002. The last Reds pitcher to hit a grand slam was Bob Purkey against the Cubs on Aug. 1, 1959. DeSclafani (3-1) also pitched a season-high 6 1/3 innings and allowed three hits, struck out three and walked four. Tucker Barnhart and Joey Votto also went deep in front of a crowd of 36,818, Cincinnati’s largest since opening day. Votto hit a three-run shot off backup catcher Chris Gimenez in the eighth. Willson Contreras and Ben Zobrist homered for Chicago, which has lost three straight. Luke Farrell (2-3), a former Red and the son of ex-Red Sox manager and current Reds scout John Farrell, was charged with three runs and two hits in his second career start. Mariners 7, Red Sox 2: At Boston, Mike Leake pitched eight shutout innings, Mitch Haniger drove in three runs and the Seattle Mariners snapped a season-high five-game losing streak with a victory over the Red Sox. Nelson Cruz had three hits and scored twice a night after hitting two homers and driving in seven runs for Seattle, which went on its skid after beating Boston two straight at home last weekend. Leake (8-4) gave up three singles, struck out five and walked two six days after he allowed five runs and took the loss against the Red Sox at Safeco Field. Edwin Diaz gave up two runs in the ninth. Eduardo Rodriguez (9-2) gave up five runs, four earned, in four innings, snapping his personal six-game win streak. The Red Sox were 13-1 in his starts this season. Rangers 9, Twins 6: At Minneapolis, Adrian Beltre and Robinson Chirinos homered to help Yovani Gallardo win for the first time since last July as the Texas Rangers beat the Minnesota Twins. Delino DeShields had two hits and drove in two runs for the Rangers, who have won a season-high seven in a row. Eddie Rosario homered and drove in four runs, while Logan Morrison also homered and Mitch Garver had three hits for the Twins, who have lost three straight. Gallardo (1-0) entered with a 15.95 ERA and made his second start for Texas after opening the year with Cincinnati. He fell behind 2-0 just five pitches into the game on Rosario’s homer before turning it around and pitching into the sixth. Gallardo gave up four earned runs on six hits. Keone Kela gave up a two-run double to Rosario, but struck out Morrison with the bases loaded to end the game, earning his 18th save. Twins starter Jake Odorizzi (3-5) retired the side in order in the first inning, but the Rangers knocked him out in a six-run second. Dodgers 8, Mets 3: At New York, Clayton Kershaw and Jacob deGrom stumbled in an unexpected ace showdown, Matt Kemp hit a pinch grand slam during a five-run eighth and the Los Angeles Dodgers beat the slumping Mets. The Dodgers have won 11 straight against the Mets dating to May 2016, matching their best run in the rivalry. Los Angeles beat New York 11 straight times across 1963 and `64. Kershaw gave up two runs over three innings in a surprise return from the disabled list. He threw 55 pitches, starting out strong before laboring through his final inning. Left-handed rookie Caleb Ferguson (1-1) replaced him and escaped a couple tight situations over four scoreless innings for his first major league win. DeGrom (5-3) allowed three earned runs in six innings, including Max Muncy’s 14th home run in the first. He entered the game with a major league-leading 1.51 ERA and hadn’t allowed three earned runs in a game since April 16 against Washington. New York has lost five straight overall and 12 of 13 at home. Orioles 7, Braves 5: At Atlanta, Mark Trumbo hit a first-inning grand slam, Chris Davis doubled in three runs and the Baltimore Orioles beat the Braves. Dylan Bundy (6-7) allowed two runs and seven hits in 6 1/3 innings while improving to 3-0 in June. One day after allowing four runs and recording only one out, Zach Britton pitched around a one-out walk to Johan Camargo in the ninth to earn his first save. AL East-leading Atlanta dropped its third consecutive game. Julio Teheran (5-5) allowed a season-high seven runs in 4 2/3 innings. Trumbo’s homer was his fourth in his last six games. He has seven homers this season after missing April with a right quad strain. Nick Markakis, who spent his first nine seasons with Baltimore, drove in three runs for Atlanta, including a two-run double off Donnie Hart in the seventh. Cardinals 3, Brewers 2: At Milwaukee, Yadier Molina homered twice to back a strong start by Miles Mikolas and lift the St. Louis Cardinals to a victory. Molina’s two-run homer in the sixth inning off reliever Jeremy Jeffress gave St. Louis the lead and the Cardinals held on behind the pitching of Mikolas and four relievers. Marcell Ozuna led off the sixth with a line-drive single to center and scored on Molina’s shot to right-center, a ball that bounced off the top of the wall and into the St. Louis bullpen. Mikolas (8-2) allowed three hits and two runs in 6 2/3 innings while walking two and striking out five. Bud Norris earned his 14th save with a scoreless ninth. Jeffress (5-1) took the loss. Indians 4, Tigers 1: At Cleveland, Trevor Bauer struck out 11 over 6 1/3 innings to beat Detroit for the fourth time this season, leading the Indians past the Tigers for their sixth straight win overall. Bauer (7-5) allowed a run in the second inning on a wild pitch and was pulled after Dixon Machado’s one-out single in the seventh. He’s 4-0 with a 1.23 ERA in four starts against the Tigers. Francisco Lindor hit a leadoff homer in the fifth, and Jose Ramirez – who reached base in his 30th consecutive game – and Edwin Encarnacion had RBI singles in a three-run first. Cody Allen struck out two in a perfect ninth for his 16th save in 17 opportunities. Francisco Liriano (3-3), making his first start in a month, allowed three runs – two earned – in four innings. Athletics 7, White Sox 6: At Chicago, Pinch-hitter Nick Martini drove in the tiebreaking run in the eighth inning with his first major league hit and the Oakland Athletics came back from an early five-run deficit to edge the White Sox. Martini, recalled from Triple-A before the game, lined a full-count single off Juan Minaya (0-2) with two outs to center to score Stephen Piscotty from second. Piscotty reached on a double when right fielder Avisail Garcia lost his routine fly in the sun. Piscotty launched a two-run drive and Matt Olson hit a solo shot as the Athletics homered in their 24th consecutive road game, tying a modern day record set by Baltimore in 1996. Lou Trivino (5-1), the A’s fourth reliever, pitched 1 2/3 innings and struck out four. Blake Treinen got the last five outs for his 17th save as Oakland hung on for its sixth victory in seven games despite committing two errors in the ninth. Tim Anderson hit a three-run homer that capped Chicago’s five-run first-inning burst. The White Sox have lost nine of 10. Both starters exited early with injuries. Oakland’s Daniel Mengden left with a sprained right foot after two innings, while Chicago’s Dylan Covey was pulled due to right hip soreness with no outs in the fifth. Marlins 6, Rockies 2: At Denver, J.T. Realmuto hit his second career grand slam during a five-run seventh and the Miami Marlins beat Colorado to stop a three-game skid and end the Rockies’ winning streak at four. Derek Dietrich also homered, and Trevor Richards (2-4) gave up one run and three hits in six innings, striking out eight. Richards also singled for his first hit in the majors. Rockies starter Tyler Anderson (4-3) was sharp before allowing three consecutive hits to open the seventh, including an RBI single from pinch-hitter Justin Bour that chased the lefty and put the Marlins ahead 2-1. Starlin Castro then loaded the bases after video review reversed an out call and ruled him safe with an infield single. An out later, Realmuto fouled off three pitches against struggling reliever Bryan Shaw before lining a shot over the right-field wall. Gerardo Parra hit a solo homer in the seventh and drove both runs for the Rockies, who fell back below .500 (38-39). Diamondbacks 7, Pirates 2: At Pittsburgh, Zack Greinke pitched six scoreless innings, staying in through two rain delays, and the Arizona Diamondbacks beat the Pirates for their third consecutive win. Paul Goldschmidt homered for NL West-leading Arizona, and David Peralta drove in two runs. Goldschmidt also walked twice and scored three times. Greinke (7-5) allowed two hits, struck out seven and walked none. He also doubled and scored on Jon Jay’s double in the fourth. The Pirates hit just four balls out of the infield against Greinke. Arizona grabbed control with five runs in the first four innings against Joe Musgrove (2-3). Phillies 5, Nationals 3: At Washington, Maikel Franco went 4 for 4, Carlos Santana homered and the Philadelphia Phillies defeated the Nationals. With the Phillies leading 3-2 in the eighth, Santana sent a drive into the Philadelphia bullpen in left-center field off Kelvin Herrera for his 13th homer of the season and second in two games. Franco later added an RBI single for the Phillies, who have won five of six. Odubel Herrera, who had homered in five straight games, went 0 for 4. Anthony Rendon homered for Washington, which has lost three of four. Aaron Nola (9-2) stiffened after a shaky first inning, giving up two runs on four hits over six. Seranthony Dominguez worked the ninth for his fourth save. Erick Fedde (0-3) allowed three runs on eight hits in six-plus innings. Giants 5, Padres 3: At San Francisco, Slumping Brandon Crawford doubled twice, tripled and drove in three runs, leading the Giants over the San Diego Padres. Brandon Belt singled twice and Gorkys Hernandez added an RBI double as the Giants won their fifth in seven games. Crawford went into the game mired in an 0-for-18 funk. He walked in the second, hit a triple off Matt Strahm in the fourth and doubled in a pair of runs off Adam Cimber (3-4) in the sixth. Crawford also doubled and scored in the eighth. San Francisco’s Gold Glove-winning shortstop also helped turn three of the Giants’ four double plays. He made a throwing error in the ninth that allowed a run to score. Reyes Moronta (3-1) retired three batters for the win. Hunter Renfroe homered for San Diego, which has dropped six of seven. Astros 4, Royals 3 (12): At Houston, Carlos Correa hit a game-ending RBI single in the 12th, lifting the Astros over the Kansas City Royals. George Springer led off the 12th with a walk, and Alex Bregman followed with a bloop single into shallow right field that fell between three players. An error by Ryan Goins allowed Springer to advance to third. After reigning AL MVP Jose Altuve was walked intentionally, Correa singled into right-center gap against Justin Grimm (1-3). Collin McHugh (3-0) pitched a perfect inning for the win. Blue Jays 4, Angels 1: At Anaheim, California, Steve Pearce hit a three-run homer in the ninth and the Toronto Blue Jays ended a five-game road losing streak. Pearce’s fourth homer was a line drive down the left-field line off Justin Anderson (1-2), who gave up a two-out single to Aledmys Diaz and walked Devon Travis to bring Pearce to the plate. Seunghwan Oh (3-2) got the win despite giving up a solo home run to Luis Valbuena that tied it at 1 in the eighth. Ryan Tepera earned his sixth save, striking out Jose Fernandez to end the game. Marcus Stroman threw five scoreless innings for the Blue Jays, who had lost 10 of their last 11 on the road. Stroman had not started since May 8 because of shoulder fatigue. Teoscar Hernandez gave the Blue Jays a 1-0 lead on his solo home run in the third. Published: June 23, 2018, 9:49 p.m.